Not sure of where I was supposed to be meeting Ruskin Bond, I suddenly noticed an elderly man, stoutly built and with a soft and kind expression, comfortably seated on a small chair amongst hundreds of books, stacked and placed in every possible corner of a tiny bookshop. 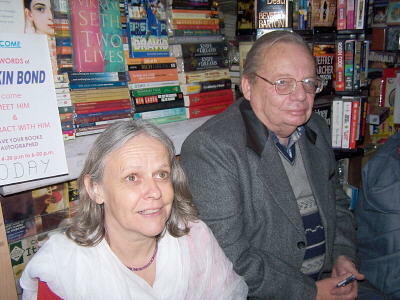 I realized that this man, whom I knew I had somehow met before, was Ruskin Bond himself – and the picture became clear. as I saw Usha sitting next to him with sparkling eyes, a glow on her face and her book being signed by him. I went in and sat beside him on the small stool at his other side. I read little of his work, but the little I had read appealed to me. It was only four days previous to our meeting that I casually came across Ruskin’s writings in some small bookshop in Rishikesh. He captivated me at once. This man who writes with such sensuousness about India, portraying love for life in India, bringing back to life playful childhood memories, was to touch my heart. To then hear that Usha had coincidentally arranged to meet Ruskin Bond in Mussoorie Cambridge bookshop was for me very exciting. Seated next to him, enjoying his gentle presence, as he signed my books, I just watched him. He could have been my granddad with his blue mischievous eyes ready for sharing stories. The only stark difference being that he had adopted Indian gestures along with an Indian accent. As he asked for my name so to sign my book he looked into my eyes, his thick glasses seemed to make his eyes go smaller and sweeter. Gradually whole groups of people came into the shop, and without any sort of resistance; Ruskin warmly looked into the eyes of each one of his fans, asking for their names, so as to sign their books. He commented that this is not very usual to have so many people visiting (I somehow could not believe him). His English charm and politeness still seemed to be a part of his heritage. The afternoon flew by. Meanwhile, all of us Yoga students from Omkarananda Patanjala Yoga Kendra were gathered around him. Coincidentally, a Yoga group from Delhi dropped into the bookshop to greet Ruskin as well. Ruskin was surrounded by young Yoga ladies, and I think he seemed to secretly enjoy all the attention. We were offered coffee by the bookshop keeper and shared stories of monkeys sitting on potties and traffic jams in Delhi. By the end of the afternoon, he concluded that it might be time for him to write something about Yoga as there are so many Yoga students around nowadays. I cannot but think of him as a charming gentleman who may someday flatter us all with a book about Yoga.